It’s been a long, cold and quiet winter around the Tiny House, but as the weather warms up there are many adventures to come. 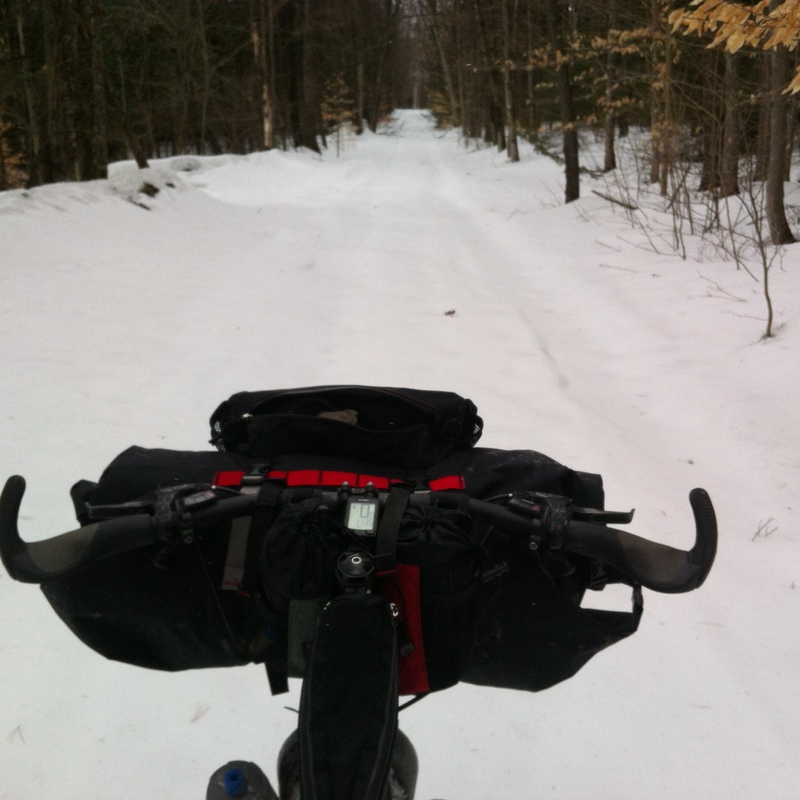 I realized I didn’t manage to write a single blog entry all winter, but I did have a few good adventures. I spent two fabulous weeks “Boondocking” in Southern Florida, exploring wilderness areas and watching Alligator families sun themselves on muddy banks. It was a great break from the long snowy winter we had. I unfortunately was in the back seat of a car which rolled over on Thanksgiving day, and really tweaked my back. The end result has been many months of Chiropractic treatments, and an inability to be as active as I normally am all winter. I only skied a handful of times, and each time I regretted it for days to follow. The plus side (since I tend to always see the glass half full) is because I couldn’t downhill ski much, I did a lot more walking in the woods and cross country skiing than I normally do. 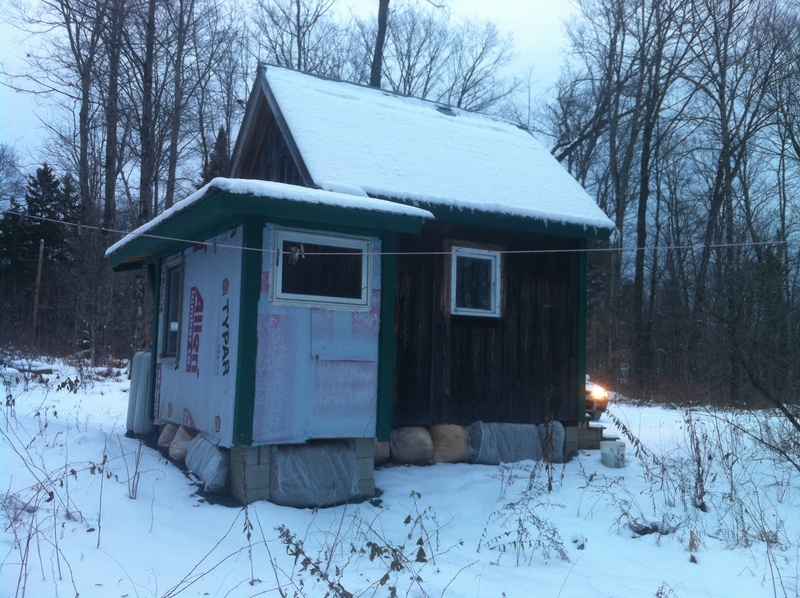 The other change the winter brought was my parents going to Florida for 3 months, during which time I closed up my tiny house (easy to do, a plus of not having indoor plumbing!) and house-sat for them. This meant my house was only heated for Oct/November and March. All winter I used less than $75 worth of propane! Not bad for heat in a Vermont winter. Last fall I had “skirted” my house with hay bales and bags of wood shavings which also helped substantially. I really noticed a difference in my floor staying warm. Here’s my Tiny House from the rear, you can see the bags of wood shavings and plastic wrapped hay bales around the entire perimeter. As spring finally makes it’s way up to my tiny house on Random Road, I’m getting out and about more but still being very cautious carrying heavy loads or doing any exercise which involves twisting or turning my body. That doesn’t stop me from dreaming up my next adventures! Luckily thus far bicycling seems to be the most demanding physical activity I can do that doesn’t aggravate my back, so clearly a bike trip is in order! Luckily the Idaho Hot Springs Mountain Bike Route (IHSMBR), Adventure Cycling’s latest gravel grinding adventure, is calling my name. This trail can be ridden as a 500 mile mountain bike loop sticking mainly to rough dirt roads high in Idaho’s Sawtooth Mountains. There are also four single track segments which are optional add-ons, creating the potential for a nearly 750 mile loop. Both the main route and the Single Track sections feature massive amounts of climbing. Looking at the elevation profile on the very detailed trail maps, it seems as if climbing 3,500 vertical feet over 10 miles is not uncommon. Many of the steepest climbs, especially on the single track sections, are considered extended “hike-a-bikes”. 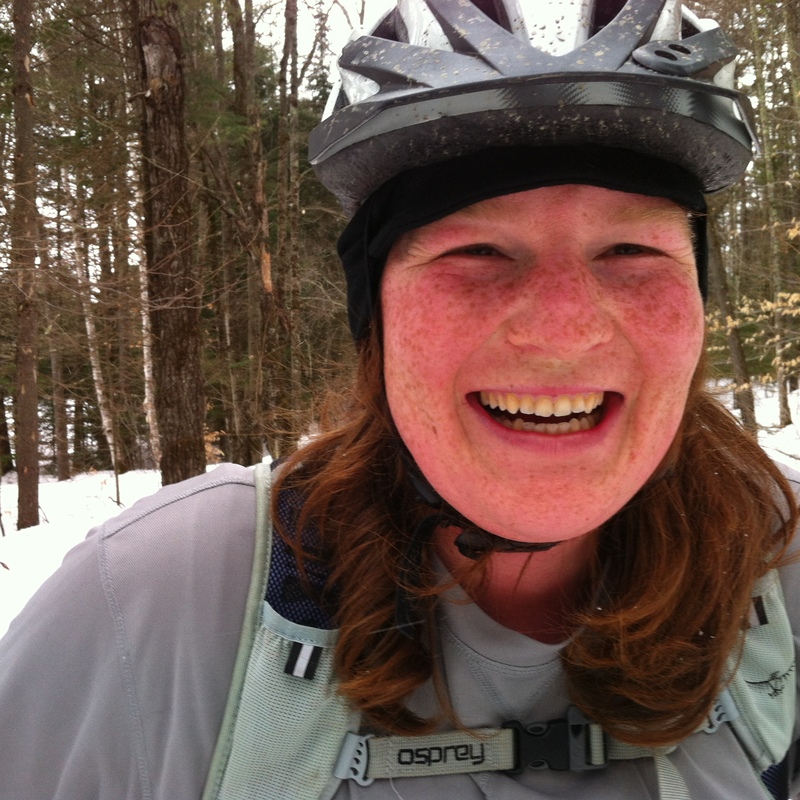 Think hiking Camels Hump with a fully loaded bike! My friend Leslie and I have been discussing this trip in general terms since it’s introduction a year and a half ago, and last fall decided we were going to attempt it this summer. Our goal is to do 2 or 3 of the single-track options, but play it by ear on how we feel and how amazing they are. We anticipate a month long trip, including a few days to prep in Boise, and a few days at the end to pack up before heading home. The very rural route goes by 50 different Hot Springs, allowing cyclists to soak their weary bones nearly every day of the trip! On the single-track sections, we plan to carry up to 7 days worth of supplies! Though we suspect each will only take 4-5 days, we want to be prepared for anything. 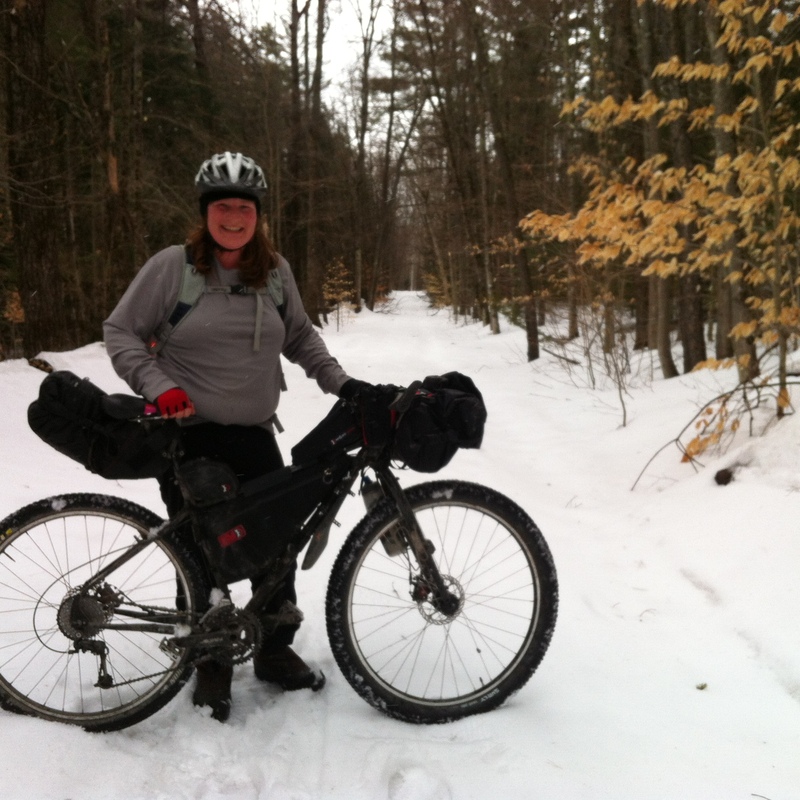 Last week was Leslie’s spring vacation, so she loaded up her bike and gear and drove to Vermont from her home in Buffalo. 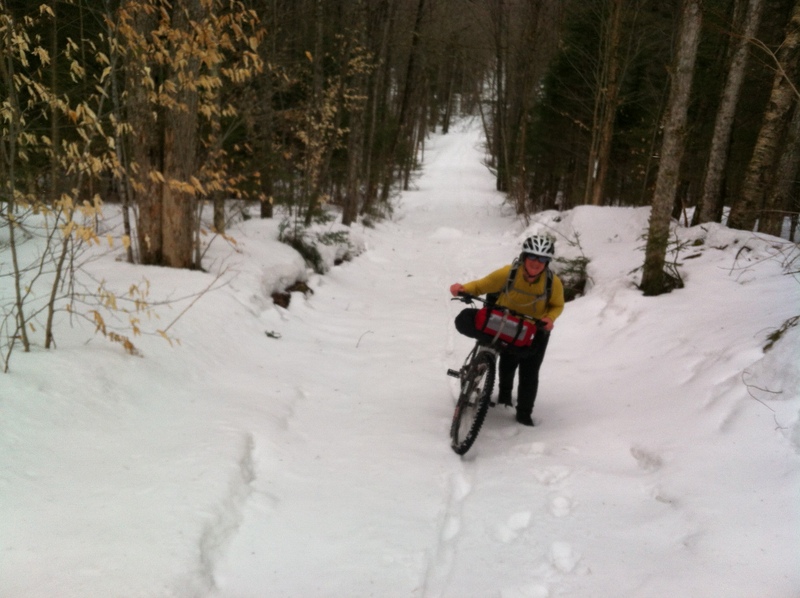 We spent a fabulous 3-4 days pouring over maps, riding on rough muddy and snowy roads, and prepping food for our trip. I’ll do a separate post shortly about food prep as we’ve decided to do a lot of cooking ahead of time and dehydrating our own meals. In the meantime, here are some highlights of her visit. 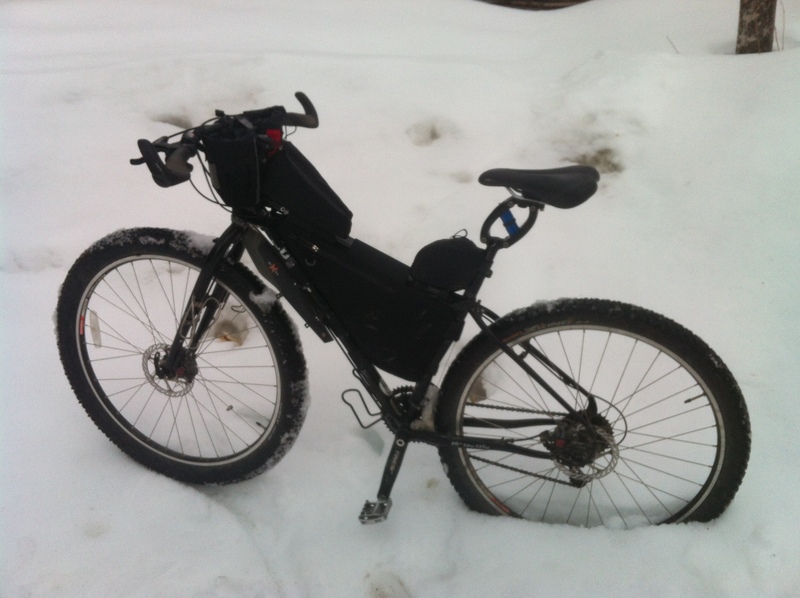 Here’s my Surly with the two top tube bags, the frame bag, and the two feed bags on the back of the handle-bar. In this shot it’s missing the front handlebar roll and the seat bag. Since riding the Great Divide Mountain Bike Route (GDMBR), I added the thudbuster seat post suspension, upgraded the front wheel to a 3.0 Fatty, and replaced my Cassette to get a slightly easier climbing gear. 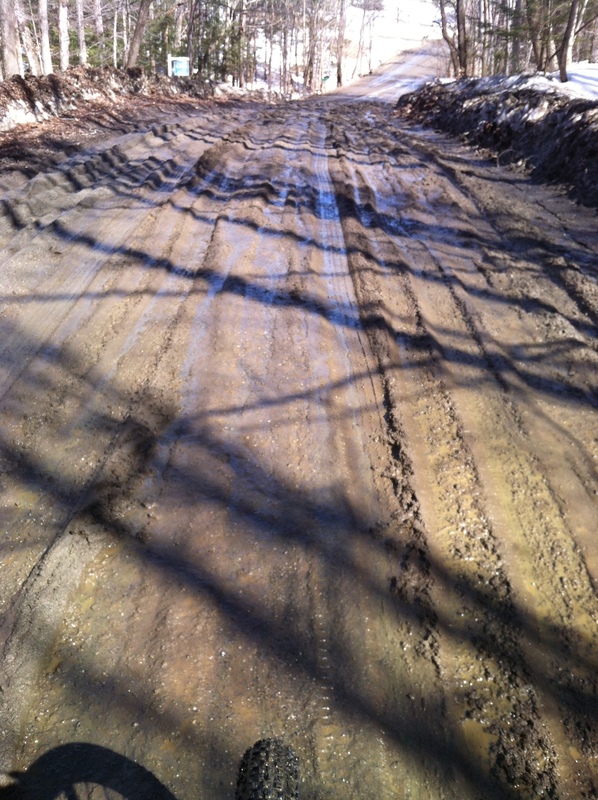 This is actually from a few days before Leslie’s visit, a mud pit on Horn of the Moon Road, half way through a 21 mile mud-fest through Maple Corner, Worcester, East Montpelier and Adamant. Rain? Sleet? Snow? Ice filled Muddy Ruts? Leslie and I get along so well because these are all things we both love!!! I told her I thought Apple Hill Road was plowed through this year, but I was clearly wrong! It’s OK, I think we need practice pushing our bikes as much as riding them!!! The gnarliest trails always put the biggest smiles on my face! That’s basically the bag set-up I’ll use for Idaho, with most of my food and cook kit in a backpack. I’ll likely add a rear rack for the long stretches where I need extra food and water. 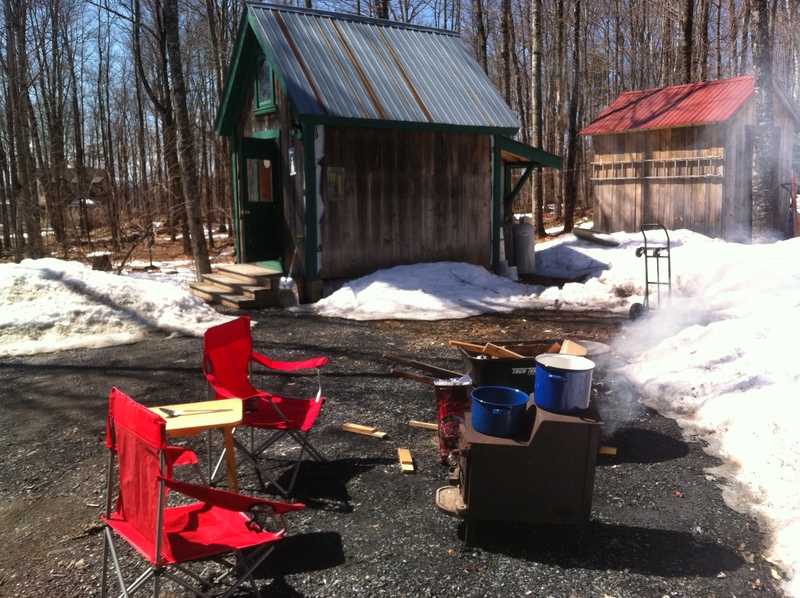 Another spring project was to tap a maple tree, just one… My plan was to just drink the sap and use it to make tea and oatmeal. It was delicious but I got way too much! So once I’d stored up about 6 gallons, I dragged this old wood stove out of it’s storage spot in my shed and got to boiling. 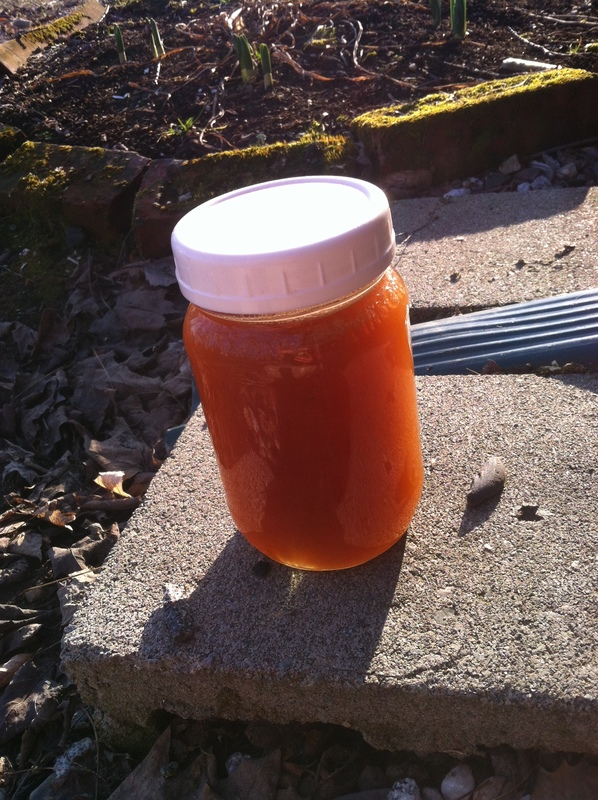 It took about 10 hours of boiling, but I got one beautiful and delicious pint of Maple Syrup. Maybe I’ll go wild and do two trees next year! Im pretty sure you are the coolest person Ever!